Fishermans Wharf in Lewes, Delaware. Christopher Ludgate photo. There are all sorts of beaches, each with its own vibe. The Hamptons own fashionable, Atlantic City has its casinos and Coney Island hawks honky talk. But what about the beach communities that don’t receive as much hype? Two that stand out are the Delaware coast towns of Bethany Beach and nearby Lewes. Their water is just as blue, sand just as white and waves just as wavy as their better-known siblings. They just don’t sport the buzz, and for some travelers, that’s just fine. My husband Jay and I had occasion to go to Bethany Beach for a wedding on a glorious weekend last October. The town looks like something out of the film “Meet Me in St. Louis” -- multi-colored Victorian houses with wraparound porches holding the requisite rocking chairs and hanging plants. 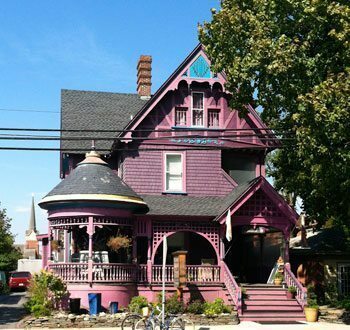 The wedding party stayed at the gingerbread-festooned Addy Sea Bed & Breakfast, a waterfront inn quintessentially Victorian in spirit and décor. The Inn has 13 guestrooms, each decorated differently and many with ocean views. True to its spirit, it serves afternoon tea in the parlor lit by a Victorian chandelier and a breakfast hearty enough to last you all day. As for the town of Bethany Beach with its squeaky-clean atmosphere, slow-moving traffic, kids biking up and down the sidewalks and the flag flying from many porches, it’s perfect for families or souls desiring a little respite from the world. It’s easy to walk from Addy Sea to the town’s charming commercial district, notably heavy on ice cream and beach paraphernalia shops. The wedding wasn’t until early evening so we drove 20 miles to Lewes, which bills itself “the oldest town in the oldest state.” Lewes was founded in 1631 by Dutch settlers who lasted a very short time before going to their reward at the hands of the natives. Even if you aren’t planning to take advantage of the beaches in Delaware, Lewes is worth a trip in any season. It’s bordered by Cape Henlopen State Park where the Delaware Bay and the Atlantic Ocean meet on one side and a national wildlife refuge on the other. Because it’s on the water, Lewes is balmier than inland towns. Also see: Santa Barbara Wine Country: Move Over Napa and Sonoma! The fishing – deepwater, surf and fly – is terrific year round. Ditto for biking, bird watching, hiking, and camping. In fact for bird watchers, spring is the best season to visit Lewes since that’s when migrating birds return along the coastal highways. In Lewes proper, a mixture of jewelry, antique and bookshops, sporting names like “Biblion – Used Books & Rare Finds”, Ginger Moon Fine Yarns and Antiques” and Habersham Peddler Interiors,” give a feel for the town’s sensibilities. For Jay and me, our favorite stop was St. Peter’s Episcopal Church, which calls itself “the oldest church in the oldest town in the oldest state.” The original building was built in 1681 in memory of its slain earliest settlers, the present one in 1857. 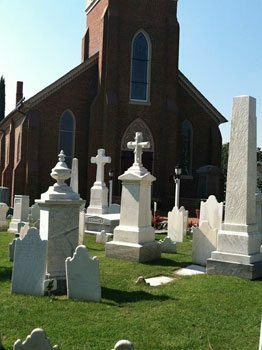 Even if the church charged a fee (it doesn’t) it would be worth the price just to roam the cemetery. In the church’s vestibule, there is a printed guide to the cemetery markers and wandering the grounds, it’s easy to get a real feel for our colonial history. The graves include a collection of some of Delaware’s most illustrious citizens, former governors and judges including Ryves Holt, the state’s first Chief Justice whose home, the oldest in Lewes, is open to visitors. In addition to luminaries, the cemetery is a testimony to the harsh life of the early settlers – Captain James Draw who died when his ship foundered on the breakwater outside Lewes (coins from the ship still occasionally wash up after a storm) and Henrietta Stotesburg, a child who died at sea and was brought to Lewes for burial. The oldest gravestones date from 1707. 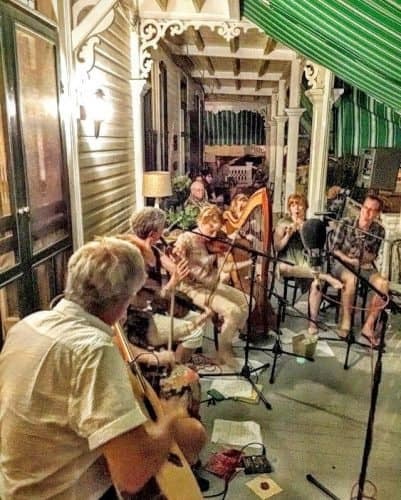 At the Chalfont B&B style hotel, live music brings the big front porch to life in the evenings in Cape May, NJ. And when you’re ready to leave Delaware’s coast? You can hop on the year-round ferry for an 85-minute trip to Cape May, NJ. The ferry has its own special charm and kids love it. Serving local fish, the food bar is a cut above what you’ll find on most ferries, though not to worry about the young ones. They can still gorge on their burgers and chicken fingers. If you keep your eyes on the water you may be delighted. Jay and I spied two sleek dolphins lazily moving in and out of the water, no worries, no problems. When you disembark in Cape May, you are yanked 150 years forward into the Victorian era again. But that’s for another article. Take the time to check out this less traveled part of our eastern coast. It’s the proverbial “something for everyone” kind of place, but also a road less traveled. 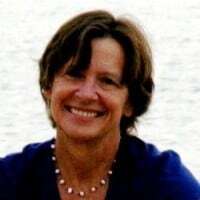 Vicky Schippers is a retired financial and grant writer who now does freelance writing. She also works as a volunteer tutor and doula. If you like the articles we publish, maybe you can be one of our writers too! Make travel plans, then write a story for us! Click here to read our writer’s guidelines. Since 2000, GoNOMAD Travel has provided travelers with inspiring travel articles, photos from destinations around the world, and a community of like-minded travelers who are seeking to learn about the world and share their travels with others. Our email newsletter will keep you up to date on the latest GoNOMAD travel articles.